DAVID O’Callaghan has opened up a commanding lead on the Cuestars South of England Under-21 Silver Tour after his third win in four outings. But the 18-year-old from Wallisdown admitted he was forced to battle hard to end the resistance of Chloe White in the final at Frames Sports Bar, Coulsdon. O’Callaghan had lost the opener to his 16-year-old opponent from Havant and trailed by 17 points with 18 on in the third-frame decider. Earlier, O’Callaghan cruised through his four group-stage matches without dropping a frame and, in a repeat of the leg-three semi-final, beat Kaine Petty (Fordingbridge) 2-1 to set up a clash with the woman’s world number 30. But he reckoned his performance deteriorated as the event sponsored by the home club progressed. “I started really well but it just got worse and worse as it went on,” he explained. “I just managed to claw frames here and there. The Kaine match was just as close as the Chloe one. I probably shouldn’t have won that one either. “I guess that when it comes down to the pressure balls, I manage to pot them. O’Callaghan won the tournaments in Waterlooville and Swindon but was runner-up to Brett Wallace (Gosport) in Salisbury. He now has a whopping 29-point lead over Wallace, who lost 2-1 to White in the second semi. Petty remains in third place. The fifth leg of ten is on O’Callaghan’s home tables at Greenbaize Snooker Club, Bournemouth, on Sunday, January 7. ROUND-ROBIN GROUP A: 1st, Brett Wallace (Fareham SC); 2nd, Kaine Petty (Salisbury SC); 3rd, Ally Pollard (Salisbury SC); 4th, Riley Ellis (147 SC, Swindon); 5th, Callum White (Waterlooville Sports Bar). 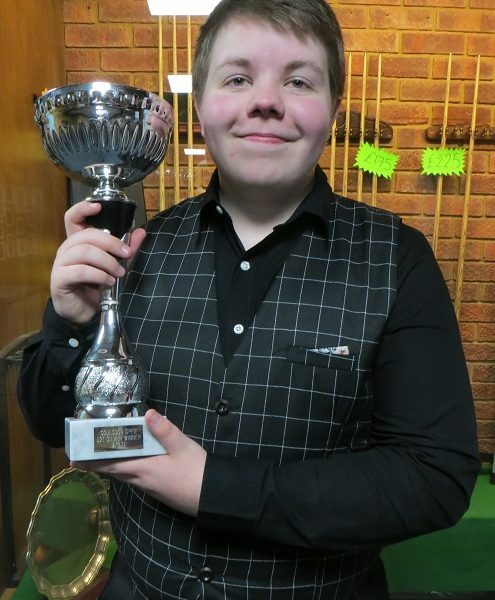 ROUND-ROBIN GROUP B: 1st, David O’Callaghan (Greenbaize, Bournemouth); 2nd, Chloe White (Waterlooville Sports Bar); 3rd, Nat Kidner (Greenbaize, Bournemouth); 4th, Keegan Reed (Salisbury SC); 5th, Shane Kearns (Jesters, Swindon). SEMI-FINALS (15 points): Chloe White 2-1 Wallace, O’Callaghan 2-1 Petty. FINAL (25/18 points): O’Callaghan 2-1 Chloe White.